When one thinks of an electrical engineer, magic and illusion might not be the first thing to come to mind. For one recent ECE graduate, art and science come together naturally. Meet Chad Lau (BSEE ’04, MSBME ’06, PhD EE ’10), an electrical engineer with a research focus in orthogonal frequency division multiplexing (OFDM) and a seasoned magician. Lau recently went to work for Harris Corp. in Melbourne, Fla., working on research and development. At the time this article was written, his role was still being fleshed out. His plans are to work on R & D for various government grants relating to wireless communications. He will likely work on health care applications as well, as Harris and other defense contractors are beginning to focus on this area. The “magic” worked. At the fair, Harris showed interest in Lau for his technical field of wireless communications as well as his nontechnical field, magic. “The rep asked me to come to Harris’ booth during the Industrial Roundtable the following day, and asked me to bring a magic trick.” An interview was not far behind, followed by an on-site visit with the company. For almost as long as he’s been performing magic tricks, Lau has been interested in engineering. He knew when he was 7 years old that he wanted to attend Purdue, a running joke his mother reminds him of still today. Inspired by parents who each work in technical fields, Lau was encouraged toward engineering from an early age. By the time he completed his PhD in the spring, Lau’s dream of attending Purdue had reaped numerous rewards, including the opportunity to work alongside some of ECE’s top faculty members. 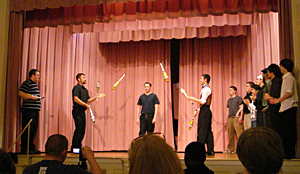 Chad Lau (fourth from left) participates in a juggling routine at Duncan Hall in Lafayette. “One of the greatest things I learned from Purdue ECE faculty is that the best way to achieve a high level of productivity is by achieving a high morale,” he says. He credits professors Michael Zoltowski, whom he admires for the friendly rapport he built with students, industry leaders, and grant collaborators alike; and Thomas Talavage, an inspiring teacher who works hard “not only on his research, but who also spends a great deal of time building good relationships with his graduate students so that the group dynamic stays positive,” Lau recalls. Lau’s interest in magic has certainly helped set him apart from his colleagues. 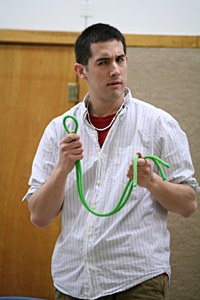 A member of the University’s Juggling and Unicycle Club for most of his 10 years at Purdue, Lau met many of his closest friends in the club and gained valuable life skills — besides how to ride a unicycle. A devotee of David Copperfield since childhood, Lau admired his confidence and great stage presence, which he knew could be parlayed into technical skills important in his career. “Joining the club is where I truly learned what it takes to have stage presence, how to present, and finally to manage my fear of presenting before audiences,” he says.